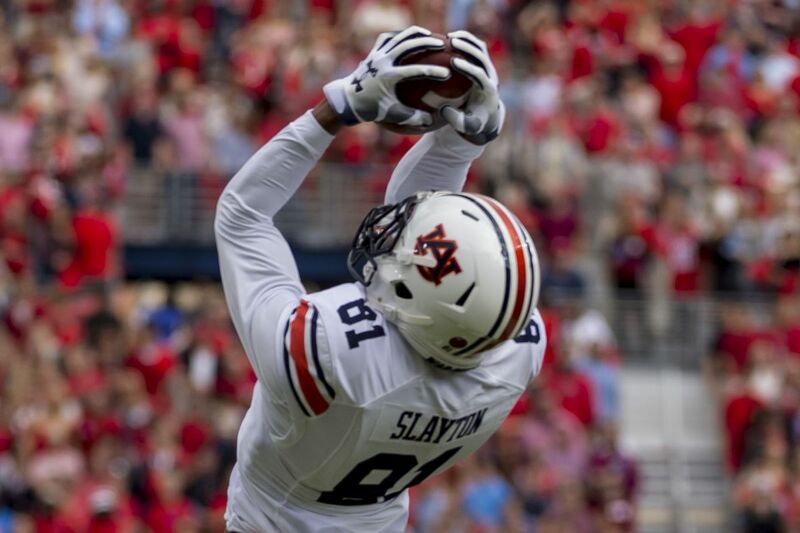 Speed kills and few receivers in the 2019 NFL draft are speedier than Auburn’s Darius Slayton. Slayton showcased that he has speed to burn by running a scorching 4.39 40 yard dash at last month’s NFL Scouting Combine. Slayton recently spoke exclusively with MCM about his successful combine, his favorite routes to run and why he loves playing the wide receiver position. JM: What was the experience like for you at the combine? DS: It was an amazing experience. I was blessed to be there. I was thrilled to get an invite. I’ve been watching the combine on television such I was a small child. It was surreal to be there. I got to meet some NFL greats out there. these are guys I’ve been watching play the game my entire life. It was really exciting for me. JM: You ran a 4.39 in the 40 yard dash, and you had a terrific vertical jump as well. Did you expect to perform as well as you did? DS: Yeah, I actually expected to perform a little bit better if I’m being honest with you. I still came away happy with my numbers. All in all, I was happy with my performance. JM: What do you think is the lasting impression you left? DS: I think a lot of people had questions about my ability to consistently catch the ball. They wanted to see how I run my intermediate routes. I believe I showed myself well in both of these areas. I’d actually go as far to say I excelled in both areas. I was smooth out there and I caught the ball well. I got a lot of positive feedback in these areas. I did a good job there. JM: What was the strangest question you were asked at the combine? DS: I actually wasn’t asked anything too crazy. Probably the strangest one, one guy was trying to test my competitive nature by asking me to count off the alphabet, so I did. He wanted me to say A1, B2, C3, etc. JM: And he said this was to test your competitive nature? DS: That’s what he said. I’m not sure how that works. He asked me these string of questions that were all like that. JM: Did you have a lot of formal or informal interviews? DS: I had a couple of formal interviews. I have a few private workouts coming up as well. JM: What’s your favorite part about playing wide receiver? DS: I love the art of it. I’m talking about route running, perfecting the releases and all of that stuff. It takes so much fine tuning and I really enjoy that aspect. You have to find what works for you. I just really appreciate the craft. I look forward to getting some NFL level coaching and getting better in every aspect. JM: Do you have a favorite route to run? DS: Right now, I would probably go with what we call a post route. I ran a lot of those at Auburn. It’s just a deep route. It usually gives me an opportunity to use my deep speed and make a play on a long ball. That’s a lot of fun for me. JM: Auburn struggled a bit as an offense in 2018. What do you think went wrong? DS: We just didn’t execute as well as we have in the past. We didn’t play as well as we should have. We weren’t consistent enough. I felt we were efficient in some spots but it just wasn’t enough. We didn’t execute at a high level. JM: Is there an NFL quarterback you’d love to catch a pass from? DS: I’d love to catch a pass from any quarterback to be honest with you. Obviously you see guys like Patrick Mahomes and Aaron Rodgers. Tom Brady is another one of course. It would be really cool to play with any of those guys. JM: In closing, what kind of impact is Darius Slayton gonna make at the next level? DS: Whatever team I go to, I just hope I can go there and help them win games. That’s all I wanna do. Winning a championship is always the ultimate goal. 2019 Titans WR Prospects: A.J. Brown ...Perhaps! What did Jon Robinson mean when he said he wanted more “wolves” and which prospects fit that description? The Titans GM wants to add "nasty" players in the trenches.